The first live incarnation of the band included Simon Hanson (Squeeze) on drums and Tyrone Thomas (Alternative TV) on bass. The end of 2012 saw a line-up change with the departure of Guy, Simon, Alrick and Tyrone and into the fold came Darrell Bath (Crybabys, Dogs D’Amour, Ian Hunter Band....) on guitar, Nigel Mogg (Quireboys) on bass, Duncan Mackay (Primal Scream) on horn and whizz-kid drummer Ryan McCormick (Steven Adler Band). This version of The Cowboys set out on the magnificently shambolic “Christmas Tatt Tour” of the UK in December 2012 playing to blown-away crowds up and down the country. 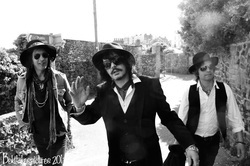 2013 saw another line-up change with Darrell leaving to tour with The Vibrators and in came guitar legend Timo Kaltio (Hanoi Rocks, Izzy Stradlin Band, Cheap and Nasty ) and taking over bass duties (whilst Nigel was temporarily back in LA) came Phil Frite – who later was responsible for engineering much of the Cowboys new recordings. See below for current line up. Marc is the frontman and main songwriter in The Cowboys with an impressive previous musical history. He previously fronted Seven (and signed a massive deal to Telstar) and then went on to form DNA Doll and toured widely in the UK and the States, also playing Glastonbury and The Isle of White Festival. He was personally contacted by Slash (Guns n Roses) and flew out to LA to work with Slash, Duff and Matt on a band then called “The Project”.... this later morphed into Velvet Revolver. The Eden-fronted version of the band wrote and recorded 4 as yet un-released tracks including an early version of “Slither”. Slash described Eden as “one of the world’s best rock n roll singers”. Upon his return to the UK he joined Ariel Bender (legendary guitarist with Mott The Hoople, Spooky Tooth) to form The Ariel Bender Band and toured widely, supporting Rod Stewart in 2007. He also recorded tracks for Bender’s “If You Dare” album. Marc then went onto form Men & Gods with Seven/DNA Doll drummer Alrick Guyler and the band gigged widely before finally signing to Pacific Records (US) and recorded the critically acclaimed (and eponymously titled) Men and Gods first album in San Diego. This featured Nigel Mogg (Quireboys) on bass. With M&G on the back-burner for a while, Marc formed The Peckham Cowboys with Dale Hodgkinson and Guy Bailey (Quireboys) and signed to Livewire/Cargo Records in 2011 and released the band’s phenomenal debut “Flog It!” later that year. Dale previously toured internationally with cult UK art rockers And Also The Trees playing guitar and keyboards for them on their Silver Soul tours to promote the band’s eighth studio album. 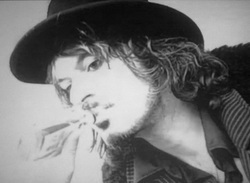 He later joined Dogkennel Hill (formed by Tim Bewlay and Guy Bailey; ex-Quireboys) and gigged widely to promote the band’s second album “All The King’s Horses”. He then went on to form and write songs with The Peckham Cowboys with Marc Eden and Guy Bailey. Timo toured with Hanoi Rocks for a number of years as their guitar tech before playing bass in the band. He then went onto play bass with Cherry Bombz (ex- Hanoi Rocks; Andy McCoy & Nasty Suicide and Terry Chimes of The Clash) and also played guitar in Johnny Thunder’s Cosa Nostra band. 2013 saw another line-up change with Darrell leaving to tour with The Vibrators and in came guitar-legend Timo Kaltio (Hanoi Rocks, Izzy Stradlin Band, Cheap and Nasty.). and taking over bass duties (whilst Nigel was temporarily back in LA) came Phil Frite – who later was responsible for engineering much of the Cowboys new recordings. During this time Timo also co-wrote “Right Next Door To Hell” with Izzy Stradlin for Guns n Roses’ Use Your Illusion album. Working prolifically at this time he played in various jam bands with members of Hanoi Rocks, New York Dolls, Lenny Kravitz Band, The Black Crowes amongst others and he also played and wrote songs with Izzy Stradlin for Stradlin’s acoustic album “Fire”. More recently he formed Tango Pirates with Dave Treganna (Sham 69, Lords of The New Church, Dogkennel Hill, The Crunch) and toured as guitarist for The Dogs D’Amour, amongst many other projects, before joining The Peckham Cowboys as guitarist and songwriter. Nigel (nephew of Phil Mogg - vocalist with the legendary UFO) is probably best known for his long tenure with The Quireboys, joining founding members Spike and Guy Bailey, to make one of the UK’s best loved blues rock n roll bands. With The Quireboys Nigel toured extensively playing support dates to The Cherry Bombz and playing The Reading Festival before signing to EMI and releasing the platinum selling album “A Bit Of What You Fancy that entered the UK chart at #2. That band toured the world playing dates with LA Guns, Soundgarden, The Cramps and Iggy Pop amongst others before touring with Aerosmith and Guns n Roses, playing Donnington Monsters of Rock Festival and most famously supporting The Rolling Stones (at the request of Mick Jagger) at St James Park in Newcastle. The Quireboys were managed by Sharon Osbourne. Later Nigel moved to LA and played in Nancy Boy which was fronted by Donavon Leitch (Donavon’s son) and recorded with Marc Eden on the Men & Gods debut album in San Diego before joining The Peckham Cowboys. He recently tour managed for Evan Dando (Lemonheads). Ryan, a highly talented multi-instrumentalist, is a relative new-comer to the music scene (tender age of just 20) but he has already recorded and toured extensively with various rock bands supporting the likes of The Commitments and Exit 10 and has recently done a major European tour playing drums for Stacie Collins and Al Collins (Jason and The Scorchers). He also worked closely with Steven Adler (Guns n Roses) on Adler’s Appetite For Destruction tour before joining The Peckham Cowboys.